The recent cases of the ‘blonde haired, blue eyed’ children found living with Roma families in Greece and Ireland respectfully dredged up a swathe of negative stereotypes and confirmed Roma’s status as the most vilified and persecuted minority group in Europe. After state authorities in Greece and Ireland had taken the children into care, the accusations of child abduction (for welfare benefits, exploitation or trafficking) flew thick and fast across social media. The news media, for its part, consistently referred to the ‘blonde haired, blue eyed’ appearance of the children and references were made to the unsolved cases of missing children Madeleine McCann and Ben Needham, suggesting that Roma might be guilty of abduction in these cases too. The media hysteria was only quelled when DNA tests proved that the child in Dublin was who the parents said she was, and Romani in ethnicity. Indeed, the ‘angelic’ Maria in Greece was also Romani, born to a Bulgarian Roma woman who could not afford to keep her child, highlighting the extreme poverty which many European Roma endure. These children are Roma, they are not ‘white’, and it would seem that the media is no longer interested. But here is where the real story is to be found. Crucial to the media commentary was how a white child could live in such abject poverty, in such squalid conditions, and how dirty Maria was. Certainly, no child should live in such conditions but once her Romani ethnicity was confirmed it became acceptable for her to live in squalid conditions, because living in poverty is understandable for Roma, in the way it would not be for us. Both cases draw our attention to the pervasive Romaphobia in Europe today: how is it unacceptable for a white child to live in such conditions but acceptable for a Romani child? There are many thousands of Romani children living in the same conditions as Maria who do not generate any media interest. At best, this suggests a double standard based on ethnic origin whilst at worst it suggests a malignant form of racism which influences how we treat Roma communities. Could you imagine the government intervening in a family of white parents with a non-white child, taking the child away and testing for DNA? The case in Dublin appears to be a kneejerk reaction to the abduction accusations in Greece (where the parents were charged with abduction). It is remarkable how readily ‘abduction’ and ‘trafficking’ were used in the media reporting of this case without a shred of evidence. Age old prejudices, particularly the one of Gypsies stealing children, informed public opinions on social media fora and the news media. When DNA tests revealed the Romani ethnicity of both children we might have expected, or at least hoped for, some soul searching over the public’s assumption of guilt or indeed apologies over the wording of the reports on the cases by the news media. Alas, this remains as elusive as the historical evidence that Roma have ever stolen children. Romaphobia is created and sustained by the overwhelmingly negative associations of Roma identity. It is manifest in institutions, attitudes and practices which conspire to present Roma as criminal, deviant, parasites who are not to be trusted because ‘they are not like us’. Since Roma arrived in Europe in the fourteenth century, they have faced marginalization and persecution but today we are witnessing an increase in overt expressions of Romaphobia across Europe. In the last few years, there are examples of repressive measures by state authorities in Italy, France, UK, Hungary, Slovakia, Romania and Bulgaria, amongst others. At present, there are anti-Roma gatherings occurring in Czech Republic with Roma families living under the spectre of threat and violence. It is not true to say that negative attitudes have lain dormant for years, just bubbling under the surface. The truth is that there is more reporting of Romaphobia (usually blaming the victim in the same breath) than ever before, and more attention paid to the Roma issue by political elite both nationally and internationally. Even in the wake of the recent cases there has been a proliferation of articles, opinions and reports on the situation of Roma across Europe, detailing their historical persecution as well as their current marginalization. But increased knowledge does not equate increased understanding. So, where do we go from here? Tackling racism is difficult and requires us to understand how racism is manifest. It is not enough simply to create anti-discrimination legislation although this is necessary to challenge overt expressions of racism. Only by challenging how the majority perceives Roma can discriminatory practices be redressed. It is the covert manifestations of racism which are more pernicious: the assumption of guilt of child abduction because the public believes that this is something Roma would do. And here is where the real challenge lies: How do we change how Roma are seen by the majority? To answer this question it is necessary to consider the key players in the integration of Roma. A common refrain is that Roma are responsible for their integration (which is partly true) but that Roma do not want to be integrated (which is not true). Roma want to be equal citizens, to be able to avail of their rights and freedoms, just like everybody else. They want to be able to get jobs, receive an education access healthcare, and live in adequate housing. In short, they share the same basic human needs as everyone else. But these needs, which you and I take for granted, is made difficult by Romaphobia. Governments across Europe, under pressure from the European Union, have tailored policies and initiated measures in an attempt to foster the integration of Roma but these have failed because they have not been able to substantively address stigmatization, overwhelming negative attitudes towards Roma, and the root causes of Romaphobia. A stigmatized group’s presence in the public sphere is regulated by numerous institutions which construct a negative image of the group and then consolidate this representation over time, so the dominant images of Roma as nomadic, criminal and inadaptable persists unchallenged. It is extremely difficult for groups such as Roma to gain access to media outlets, such as newspapers or television, which will help combat negative associations of their identity. Roma are often represented in the media as either criminals who perpetrate crime or as victims who are persecuted. Rarely do Roma occupy the middle ground: their ethnicity is mentioned so that the reader can determine whether the Roma in question are ‘good’ or ‘bad’. The only way to break down walls between Roma and non-Roma is through interaction. Integration is only possible through interaction. If Roma and the majority live separate lives, where Roma attend special schools or live in ghettos surrounded by other Roma, then there are no opportunities to challenge stereotypes. A lack of interaction provides the space for negative associations and myths surrounding Roma culture to go unchallenged. When stereotypes take hold they are difficult to unpick. Certainly, investment in improving the educational attainment of Roma is important. As more Roma become educated they will be more effective in making demands, expressing the needs of their communities, and providing a dialogue with the majority in devising strategies for common problems. In policy-making Roma are presented as a problem community requiring a solution. Roma are frequently frozen out of policy deliberations at the national and supranational levels and do not have a voice of their own. In the absence of a kin state to lobby and argue on its behalf, the European Union has reluctantly emerged as an ally for Roma communities and has confirmed that the primary responsibility for Roma integration lies with national governments, not the European Union. The European Union has symbolic power and can put pressure on national governments, but efforts to challenge stigmatization and improve the ability of Roma to access healthcare, adequate housing, employment and an education can only be implemented in the local and national context. There is a danger that Roma are increasingly seen and treated as a European issue which would absolve national governments of their responsibilities to their citizens. It is important to anchor Roma in the countries they reside and include Roma in the devising of strategies and policies which will help facilitate their inclusion. We are at a critical juncture in terms of how we address the persecution of Roma communities across Europe. The stain of stigmatization must be eradicated because it serves no useful purpose and undermines efforts at Roma inclusion. 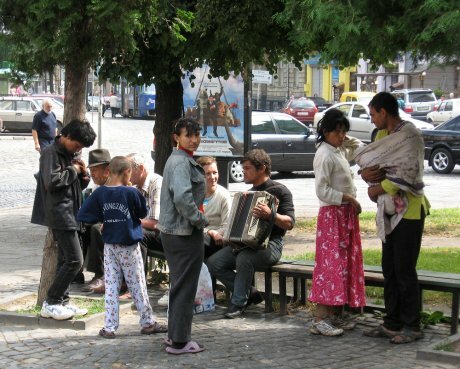 The recent cases in Greece and Ireland have revealed the dominant negative stereotypes of Romani communities and suggest that Romaphobia is an acceptable form of racism.